In the early 12th century a group of Savigniac monks came from France to establish a monastery in the north of England. After four wrong choices of sites, they settled at Byland in 1177. By the mid-13th century, building was complete and the monastery began to prosper. 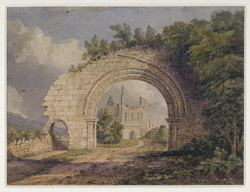 When the Abbey was at its height of its influence and popularity, it was considered one of the three greatest monasteries in the north. The remains certainly give support to the assumption that Byland was an outstanding ecclesiastical site. Sadly, the Dissolution of the Monasteries in 1539 brought about its demise and it suffered the same fate as many other monastic establishments in its woeful destruction.